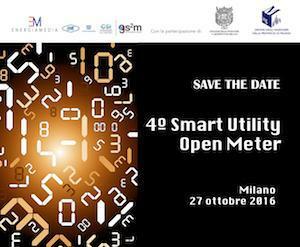 On October 27, the 4th Smart Utility Open Meter (SUOM) will take place in Milan. The event represents the opportunity for experts on smart meter to discuss and share the technological and market progress. The focus of the 4th SUOM will be on the gas sector and on the telecommunication strategy and on the possible services to offer to consumers in order to implement the Smart Cities. Within the 4th SUOM context, AISFOR will share with the experts the results of the USmartConsumer project to promote the dialogue between all market actors and to promote the development of innovative services for a "smart" consumer.